Several mainstream journalists appeared to seek a deep political meaning in Mitch McConnell’s reaching for Trump’s hand as he climbed White House stairs, only to find out that the senator is a polio survivor for whom stairs are a challenge. 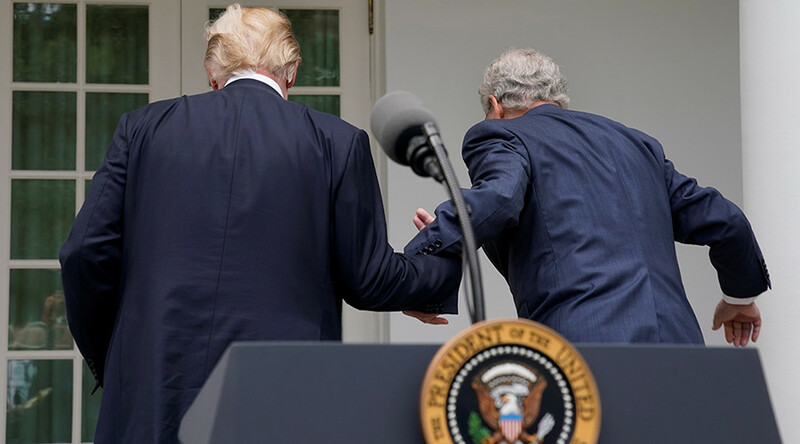 Following lunch and a news conference with US President Donald Trump at the White House Monday, Senate Majority Leader Mitch McConnell (R-Kentucky) briefly reached out for the president’s hand to help himself up a few steps. Many would not have noticed the occurrence, had it not been for several inquisitive journalists who took to social media to suggest that there was more than met the eye. “That hand-lock between Trump and McConnell, though,” tweeted CNN reporter Daniella Diaz. “Okay someone please explain to me what's going on here,” chimed in Andrew Kirell, senior editor for the Daily Beast. “Yeah, people are massively overthinking this. McConnell not a fan of stairs,” noted Bloomberg reporter Steven Dennis in the chain of replies. The Daily Beast editor received a series of similar corrections. Cant lift his right leg properly. At the Monday news conference with McConnell standing next to him, Trump said he feels closer to the senator “than ever before,” and that they’re together fighting to pass tax cuts. The president had previously criticized McConnell for his handling of the GOP agenda, including the failure to repeal and replace Obamacare, a key promise Trump made. During the campaign, Trump was accused of mocking New York Times reporter Serge Kovaleski for his disability. Trump said that he never intended to mock his impairment and that he was simply portraying the reporter’s getting “nervous” because he had changed his story. “For the 100th time, I never 'mocked' a disabled reporter (would never do that) but simply showed him ‘groveling’ when he totally changed a 16 year old story that he had written in order to make me look bad. Just more very dishonest media!” Trump tweeted in January.